when temperatures can still dip as low as -30° C (-22° F) and snow still covers most of the ground. 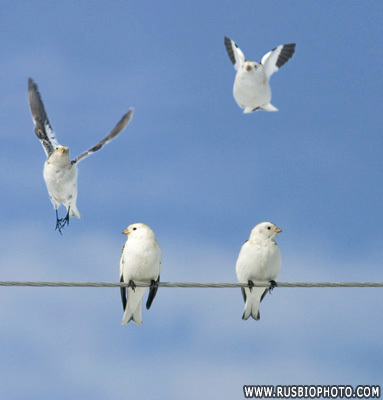 The female does not return until four to six weeks later. 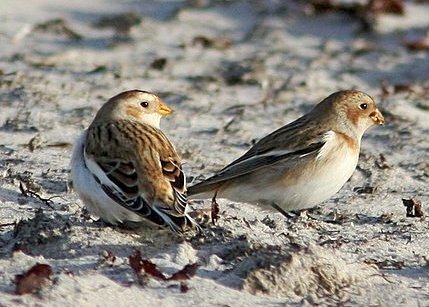 Early arriving Snow Bunting males set up and defend territories that include good nesting sites. 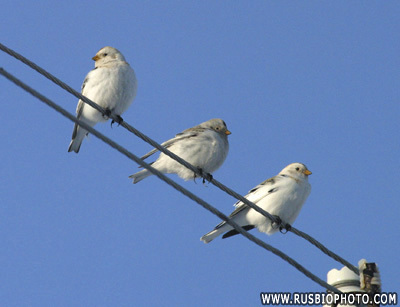 and usually roost in loose groups of from 30 to 80 birds. 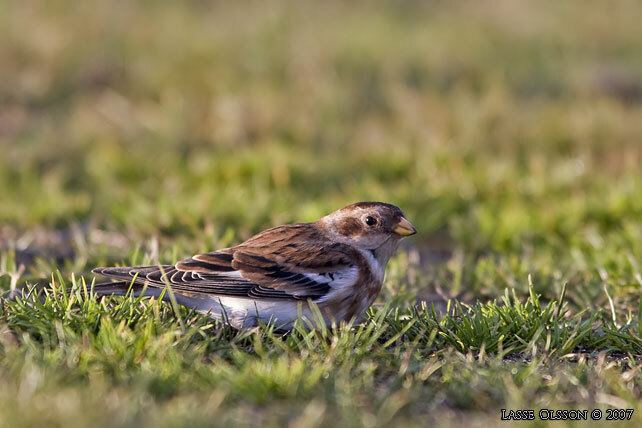 The Snow Bunting places its nest deep in cracks or other cavities in rocks. Although such nest sites are relatively secure from predators, rocks are cold. but the female must remain on the nest for most of the incubation period. The male feeds her while she is incubating so that she does not need to leave the nest very often. 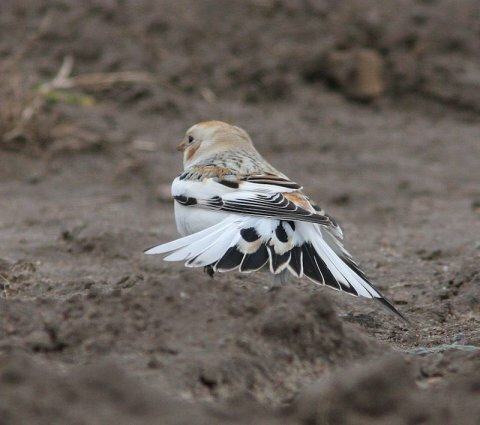 the Snow Bunting has only one molt each year and no true "Alternate Plumage." and the body feathers all are white. and he is immaculate white and jet black by the time breeding begins. 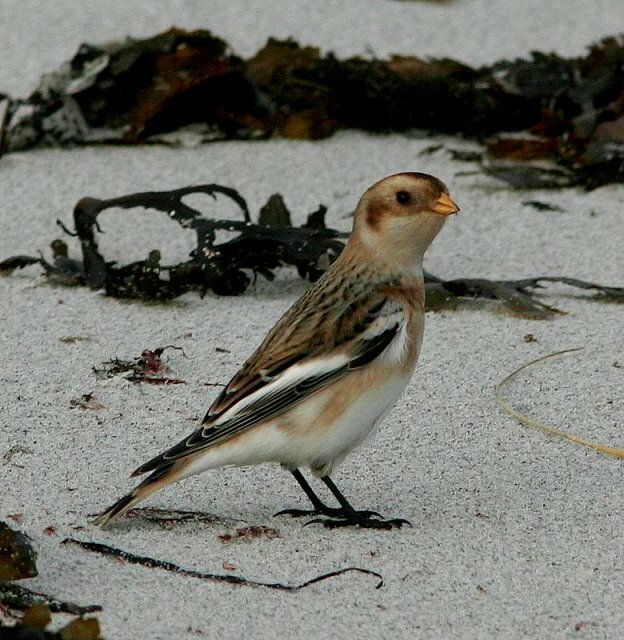 The Snow Bunting is 15 cm (6 in) long, and has a wingspan of 30 cm (12 in). The weight is from 31 to 46 g (1.09-1.62 ounces) . 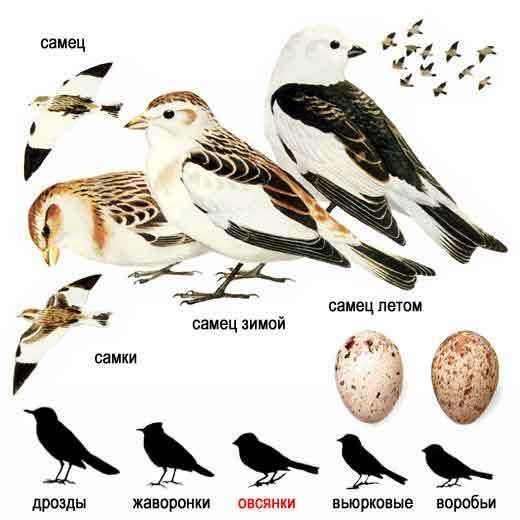 Breeding male clean black-and-white, female streaked with gray and rufous. Similar in nonbreeding plumage, but female with darker wings. 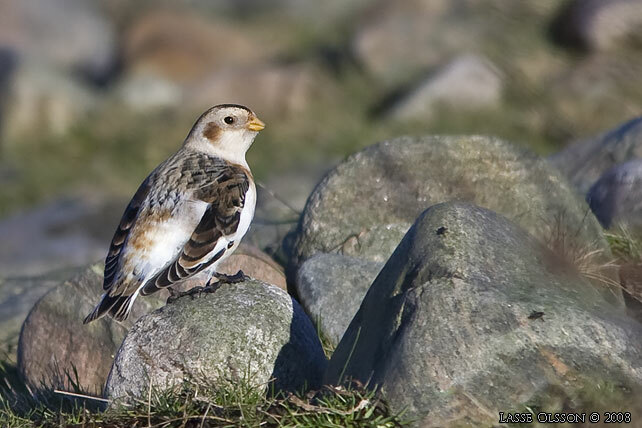 The Snow Bunting breeds on rocky tundra. Winters in open weedy and grassy fields and along shores of lakes and oceans. Food consists mainly of weed and grass seeds, insects. Walks on ground and pecks at food. May jump up to take seeds from taller stems. rootlets, and fur and feathers. Placed well back in cavity in rocks, such as cracks. In the clutch there might be from 2 to 7 eggs. They are creamy white with variable brown spots and scrawls.